Eric Bibb talks Migration Blues: "I have plenty of musical goals left... I am not bored or burned out!" 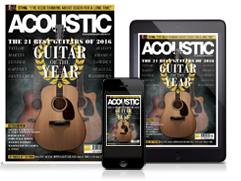 The master of acoustic blues talks about his innovative new album, and how he stays creative after 40 glorious years of making music. Professional guitarists almost always start with cheap, hard-toplay guitars, and Eric Bibb was no exception. The next stage is that first big show, and discovering if you have stage fright or not. “I don’t have stage fright now. Live TV can be nerve-wracking, I don’t really enjoy live television. I love live radio. I remember playing at school, and at summer camps: they felt like big shows to me, I was always performing. “My first big gig was playing guitar in my dad’s TV show band, which included some heavyweights - Ron Carter was playing bass. I was 16, and I could barely read the charts, but my dad must have thought about throwing me in the deep end and seeing if I could make it. Now in his mid-60s, and looking half of that, Bibb is able to think back about his heroes, the artists he grew up hearing and admiring, and some he has gone on to play with as a peer. “People I loved growing up were people like Josh White, Odetta, Leadbelly, Judy Collins, Richie Havens, and later, all the blues greats. I saw Son House perform at the Newport Folk Festival in 1965, that blew my mind. I also loved Taj Mahal, and I have worked with Taj, which was wonderful. “I do look back to when I started, and then I think how long it took me to get here, and I remember that there was a lot more of that than this. I’ve put the work in, and I am really proud of that. I have not had overnight success, I have had straight jobs and busked and worked to get to where I am now in my life and my career. Admirers of Eric Bibb would point out that he does have a unique style, both visually - we’ll come back to that - and also in stylistic terms. Bibb describes his own take on his playing style. “I’m a fingerstyle guitarist. I’m not a strummer like Richie Havens who was a master strummer, and I’m not a lead player like Robert Cray. I am a Piedmont style guitar player, that ragtime hokum style, and delta blues is in there as well. I arrange in the way that supports the song. I am not an improviser; I accompany myself and do that comfortably. “I consider myself self-taught in the sense that I have evolved my own technique. I had classical lessons from the age of eleven, and I learned to use all my fingers to play, so I had good technique in terms of getting around the guitar. I did learn some theory as part of my classical guitar lessons. I learned to identify chords, but I am not a good reader. I had theory lessons in high school, and it probably helped, but it doesn’t play a big part in what I do. I write a lot and I gig a lot, and that is my practice. With success comes rewards, and awards, and Bibb has received accolades and nominations over his career, the most recent being nominated as Blues Artist Of The Year by Jazz FM. Which guitars and amps do you use now? “The guitar on the cover is an interesting instrument. It started out as a 1960s Germanmade 12-string made by Otwin, and that was converted into a resophonic guitar by having a resophonic cone built into the guitar. It was done by a German specialist called Peter Wahl who converts acoustic instruments into resophonic instruments. I love that guitar, it reminds me of an oud; it has a unique sound which I love. “Another instrument I use is a six-string banjo from the 1930s which is what Django played before he switched to guitar. My good friend Roger Bucknall at Fylde Guitars has made some guitars that I used. I worked with a player called Michael Jerome Browne, and he plays a National from the 1930s that is a resophonic guitar, and he plays a Guild from the 1960s which he uses with a tremolo. He plays a fretless banjo on the first song, he is a wonderful musician. “I don’t play through an amp on this record. I use DI and several microphones. On stage these days, I use a Roland Chorus Jazz Amp which has been reissued in a smaller version. It has a chorus and vibrato setting which you can set yourself. The previous ones were pre-set and non-adjustable, but this new one has settings you can operate for speed and depth. I have Fishman pickups and through that amp is a sound I really like. Like most musicians, Bibb is never still in creative terms. Although he is going to be busy touring with his new album, the next one is already in the early stages of composition, as Bibb confirms. As a musician of long experience, Bibb has witnessed the massive changes in the music industry - the elimination of almost all the big labels, and the rise of DIY production, helped by social media. It’s clear from the enthusiasm and joy with which Bibb discusses his life and his music, that retirement is not in the frame, but future musical explorations certainly are, as he confirms. “I don’t have retirement in sight; I am really just hitting my stride. I would like to spend more time at home, and less on the road. I’d like to teach more as well, I recently attended Jorma Kaukonen’s Fur Peace Ranch music camp for the second time, and sharing what I have learned from years on the road is enjoyable, and I’d like to teach more. 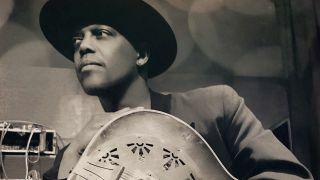 It wouldn’t be polite to finish an interview with Eric Bibb without reference to his most identifiable feature, his hats. Bibb is as enthusiastic about his hats as he is about everything. Migration Blues is out now.